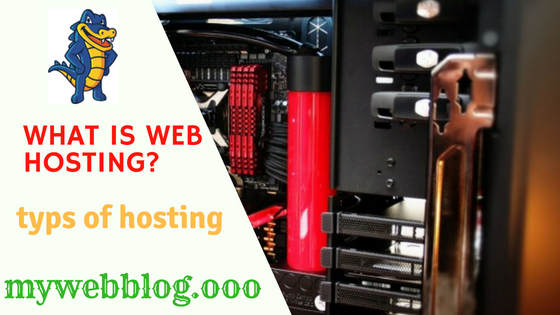 What is Web Hosting - Just as you need a shop location in order to keep your products, your business website needs web hosting service to be displayed online. Web Hosting Basically is a place where people do their websites to the store. It is basically a place where files used in any website are stored like HTML, Documents, Images, Videos, etc. "Web Hosting" are companies that provide free space to store Websites on their computer/server and provide internet connectivity so that with the help of other computers Internet, the files can be accessed by those websites. Can view and download files. In simple and straightforward terms, you can say that "Web Hosting is the place to keep the stores of your website in the store, which is provided by web hosting companies and with the help of which more people can access the contents of that website. The hosting service stores your website files on the web servers (high-level computers). Whenever someone writes his address or URL in their browser to access your website, This web server then receives a copy of your website files by accepting that client's request to his computer, As a result, your website opens up on the customer's computer. We can not trust this kind of web hosting, Because this type of Web Host will host our website for a long time and when will delete our website completely from our Web server, There is no guarantee of this.Even before taking us the backup of our website, it's not even given by this kind of Free Web Hosting Providers. Therefore, it is better to stay away from this type of Web Hosting Providers. This type of Web Hosting is used to host most websites at the present time, Because these Web Hostings are the cheapest but adequate resources providers, Those who have limitations, but not so much, That we can not use them to establish our online business. This hosting is like living in a hostel. Just as you share your stay with many in the hostel, Similarly, a lot of websites is hosted on a physical server under this hosting type. The shared server offers all these websites the ability to use resources such as web space and CPU, RAM, resulting in a cost of this hosting type less than both types of hosting. So if you have a limited budget start-up and you feel that your website traffic is also limited, then Shared Hosting is a great option for you. These types of servers are actually virtual servers, Where physical resources available on the same server computer are made more than one by creating Virtual Servers. For example, when you place CPU Cores and RAM to run a second operating system in an operating system through a software such as VirtualBox or VMWare on your computer system, Just like you can setup a Virtual Box or VMWare by your hosting provider, You can install software as you like.That means that you can remotely access and manipulate that host like your personal computer. VPS uses virtualization technology, in which a physical server is virtually divided into different servers, as a result of which, on the same server, the rest of the websites cannot access the web space and resources of your part. Due to this, this hosting gives you benefits like privacy and security. This hosting is like a living room, where you share your main gate with everyone, but you also get your privacy by having another door at your home. So if you want to take advantage of the features of a dedicated server at a lower cost then choose VPS hosting. In this type of Web Hosting, you are provided with a separate Web server, On which you get Root Access as an Administrator. It can also have two types of servers, Those known as Self-Managed Server and Unmanaged Server, and Price of these two types of servers vary. Dedicated server facilitating gives you finish control over your server, where you are given root access to the administration. And more importantly, the use of your server and resources in this hosting is restricted to others, they can be used only by you, hence the level of security is the highest in dedicated hosting. Dedicated hosting is considered the ideal hosting solution for e-commerce, confidential and sensitive issues, large database and high traffic sites due to its high performance, security and control benefits. This hosting is like a living in a big house, where you have complete control but you also bear all the expenses of maintenance.